A number of farmers in the Languedoc have taken to feeding their cattle local red wine to improve the flavour of their beef. According to The Independent, local farmer Claude Chaballier has been feeding his cattle wine from the village of Saint-Geniès-des-Mourgues, resulting in “lean, marbled and tasty,” beef. 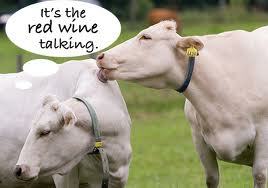 Chaballier fed the wine to three of his cows last year in a trial run, and is set to repeat the experiment next month. Two Angus cattle and one Camargue cow were fed a mixture of leftover grapes, barley and hay before two litres of wine were integrated into their diet. Keen to develop the practice on a small scale locally, Chabellier says he will use a regional wine in next month’s experiment and is even considering using Muscat from Lunel-Viel to give the meat an aromatic character.